Man. 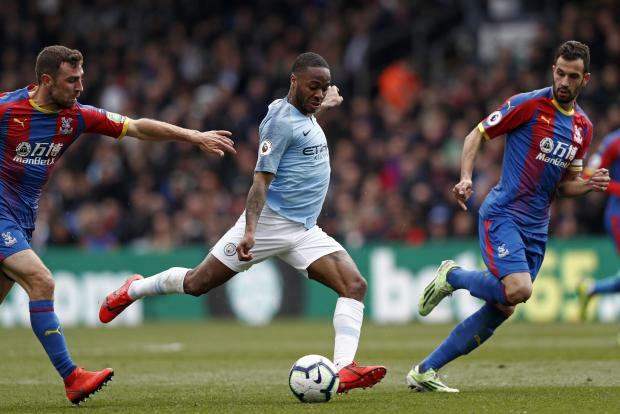 City's Raheem Sterling (centre) rushes through between Crystal Palace's James McArthur (L) and Luka Milivojevic to take a shot. The English champions move a point ahead of Liverpool, who host Chelsea at Anfield later on, with five games remaining for both sides. ⭕| RAZAAA! Here's City's first goal, where Kevin de Bruyne played an exquisite ball to Raheem Sterling, who scored a beauty! (1-0) #CRYMCI ???? #ManCity ??? ?